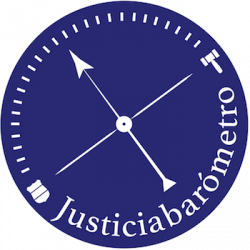 Justice in Mexico’s “Justiciabarómetro” research initiative is a systematic attempt to gauge the current levels of professional development and attitudes among actors currently operating throughout the Mexican justice system, including police, prosecutors, public defenders, and judges. Working with U.S. and Mexican academics and experts, this initiative seeks to help evaluate the professional development of actors operating within the justice sector, the functioning of the judicial system, and their general perceptions and opinions on related topics. The intention of this effort is to help provide useful baseline measures for the purpose of future benchmarking and evaluation of the Mexican judicial system. Perspectives on Mexico’s Criminal Justice System: What do its operators think? 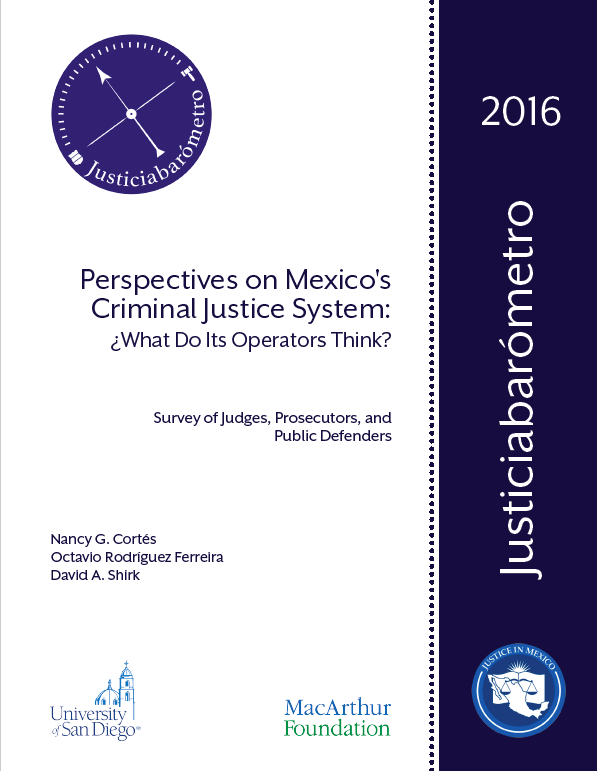 On November 14, 2016, Justice in Mexico presented the results of its latest Justiciabarómetro survey, which provides a comparative analysis of the justice system operators’ demographics and perspectives, as well as comparisons to similar data collected in 2010. Survey participants included 288 judges, 279 prosecutors, and 127 public defenders in 11 Mexican states, with a response rate of 56%, a 2.4% margin of error, and a 95% confidence interval. Importantly, the study finds that there have been changes in judicial attitudes toward recent reform efforts, including a notable increase in favorability among judges toward the use of oral, adversarial trial procedures. 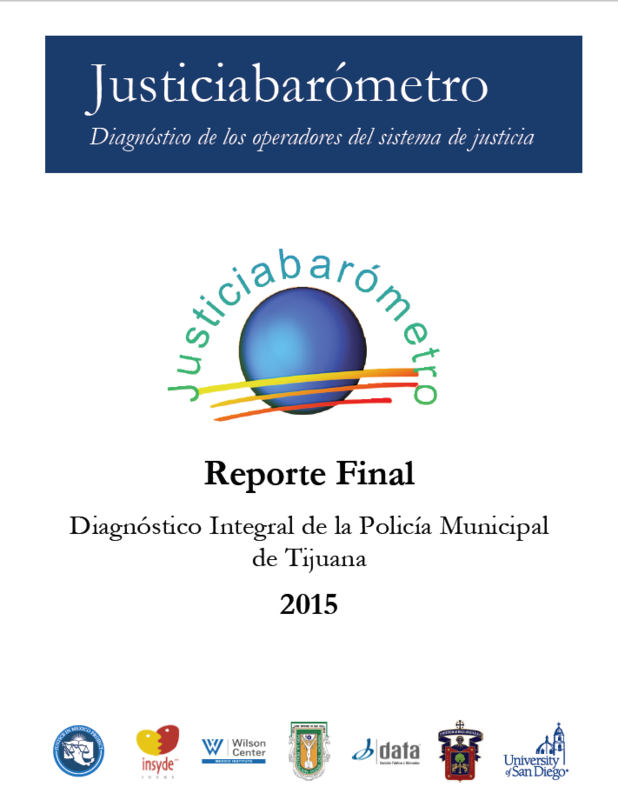 On March 12, 2015 Justice in Mexico presented the results of its latest Justiciabarómetro survey, titled: Diagnóstico integral de la policía municipal de Tijuana (in Spanish). The Tijuana survey builds on the findings of two similar studies conducted in Guadalajara in 2009 and Ciudad Juárez in 2011, and was implemented for Justice in Mexico by the polling firm Data Opinión Pública y Mercados (DATA-OPM) form Mexico. Like these previous studies, the Justiciabarómetro-Tijuana constitutes one of the largest independent studies of municipal police ever published in Mexico. Focusing on the border city of Tijuana, adjacent to San Diego, California, this is the largest survey conducted by an independent group of institutions with 1,917 participants with a minimum margin of error (+/- .87%) and a confidence interval of about 99%. On September 26, 2011, JMP presented the results of its latest Justiciabarómetro survey, titled A Comprehensive Assessment of the Municipal Police of Ciudad Juárez which along with the Guadalajara survey, represents the largest independent studies of a police force ever published in Mexico. Focusing on the border city of Ciudad Juárez, adjacent to El Paso, Texas, this study focuses on one of the country’s most important industrial cities and, at the time the survey was implemented, the most violent municipality in Mexico. 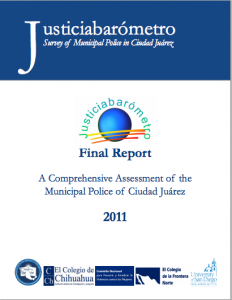 This study surveyed 75% of the 3,146 municipal police officers serving the roughly 1.3 million inhabitants of Ciudad Juárez. This survey was conducted in June 2010, during the worst year of violence of the border city. 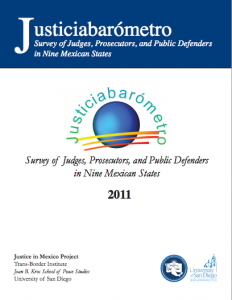 This survey summarizes the findings from a poll of 276 judges, prosecutors, and public defenders in nine different Mexican states. The study provides new insights on the profile and opinions of judges and lawyers working in the Mexican criminal justice system. Respondents from nine states were included in the survey: Baja California, Coahuila, Chihuahua, Jalisco, Michoacán, Nuevo León, Oaxaca, Yucatan, and Zacatecas. The survey includes a variety of questions on demographic characteristics, professional profile, perceptions of judicial system functioning, perceptions of lawfulness, corruption, due process and the criminal justice reform of 2008. 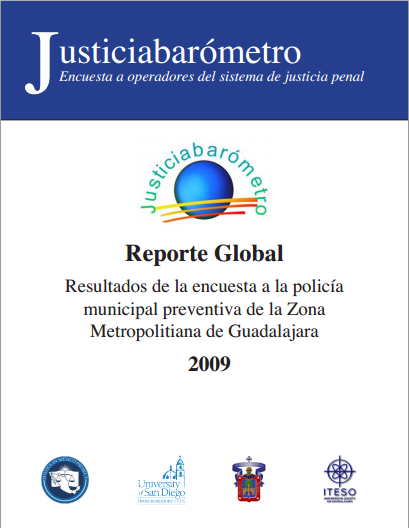 On December 18, 2009, JMP released the results of a groundbreaking survey titled Justiciabarómetro: Zona Metropolitana de Guadalajara. The survey represents the largest independent study of a police force ever published in Mexico. Focusing on the Zona Metropolitana de Guadalajara (ZMG), one of the largest metropolitan areas in the country (second only to Mexico City), this study surveyed nearly 80% of the 6,873 municipal police officers. Due to its magnitude, breadth of inquiry, and high level of participation, this study makes a noteworthy contribution to the study of public security issues in Mexico. 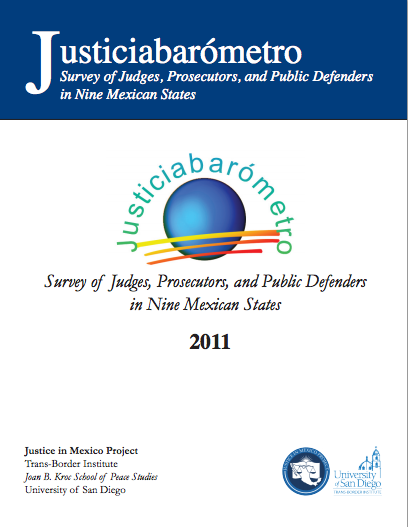 In 2008, the Justice in Mexico launched an unprecedented research project, the Justiciabarómetro initiative, to study the main operators in the Mexican justice system, namely: police, prosecutors, public defenders, and judges, precisely to contribute to the debate on the democratic police and judicial reform in Mexico and to create a dialogue among diverse actors, high-quality qualitative and quantitative inputs.